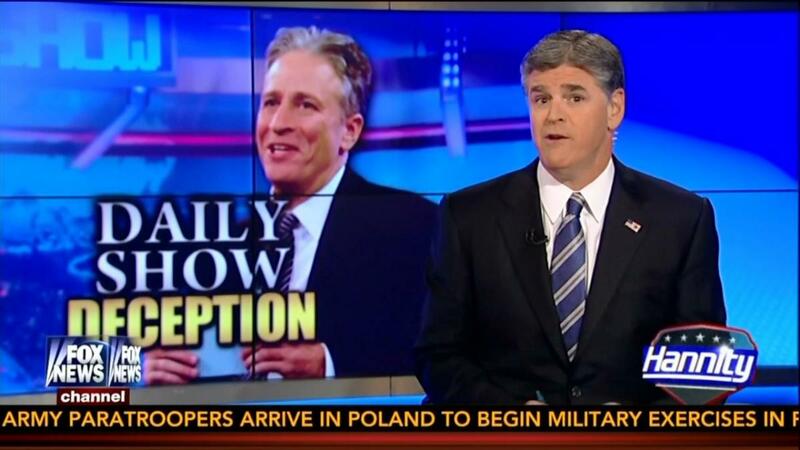 Sean Hannity went after Comedy Central jokester Jon Stewart Tuesday night at the top of his program. Stewart mocked Hannity on Monday for sticking up for rancher Cliven Bundy. Protesting the government for excessive force brought to the Bundy ranch, Hannity mocked Stewart posing as “such a devout law-and-order type of guy." HANNITY: We going to do this every time somebody owes the government money? We're going to send 200 armed agents and snipers? Maybe just put a lien on their property. Now, there are real domestic terrorists. Tim McVeigh is one, and we saw what they looked like in Boston one year ago. Cliven Bundy is not a domestic terrorist. Now, Jon Stewart -- he's had President Obama on his program. He was a guest most recently, I guess, in 2012. Did Jon Stewart ask Barack Obama about his friendship, this unapologetic domestic terrorist? Let's see, Bill Ayers, Bernardine Dohrn? Well, Barack Obama began his political career in their home, gave speeches with him, sat on boards with Bill Ayers. You know, the more I think about it, I guess I can't expect a comedic hack and his army of writers -- I can't take them too seriously. Here's a prime example. Now, you may remember that Jon Stewart had a, quote, "Rally to Restore Sanity." That was back in 2010. He held it on the National Mall. He invited all of his friends to attend, including this singer right there, Cat Stevens. Remember Cat Stevens? He has since changed his name to Yusuf Islam? There's one problem with inviting Mr. Islam to a rally aimed at restoring sanity. Oh, that's the same Islam who infamously is unapologetic for endorsing a fatwa -- meaning to kill a novelist by the name of Salman Rushdie when he wrote "The Satanic Verses." But given Jon Stewart's stance on the Bundy situation, I can't say I'm really surprised. What? Jon Stewart had a radical Muslim sing at his "Rally for Sanity"? Yes, and it's true that Yusuf Islam endorsed a deadly fatwa.